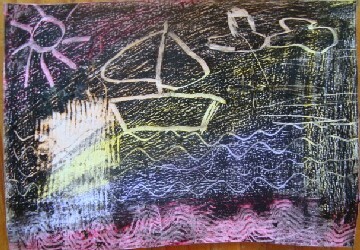 Instructions for an easy craft for kids in this etching activity using wax crayon. 1. Ensure that there are enough black crayons as they will be used a lot. 2. Give warnings and supervise the children properly when they work with the sharp utensils to do the etching. 3. Give each child only a small size page as it is a big task to color the whole page black. 1.Cover the whole page with a variety of coloured wax crayons, but not black. 2. Do not leave any parts of the page white. 3. Use the black wax crayon to colour over the whole page. 4. Use a sharp object to scratch a pattern or a picture into the black layer, revealing the colours underneath. Drawing is an activity that enables children to express their feelings, rather than talk about them. Scribbling helps to develop fine motor skills. 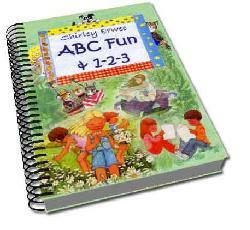 at ABC Fun & 1-2-3 - a preschool activity book by Shirley which offers age-appropriate learning activities intended to gently stimulate children and make planning easy for busy moms (and teachers). ABC Fun & 1-2-3 eliminates the need to spend time searching for suitable, age-appropriate preschool activities. Instead you can spend more time with your children, doing the things you love! In just a few minutes, you could have ABC Fun & 1-2-3 at your fingertips, in e-book format, ready to start using with your children TODAY! Click here for more info or to purchase ABC Fun.